Now you can have the superior energy-efficiency and maintenance-free performance of vinyl with more color flexibility. Eight premium exterior colors in addition to traditional white and tan, means you can coordinate colors with your exterior trim, siding and stucco. All windows with Milgard Premium Exterior Vinyl Finishes have a white interior. Exterior Standard colors are available with matching white or tan interiors. 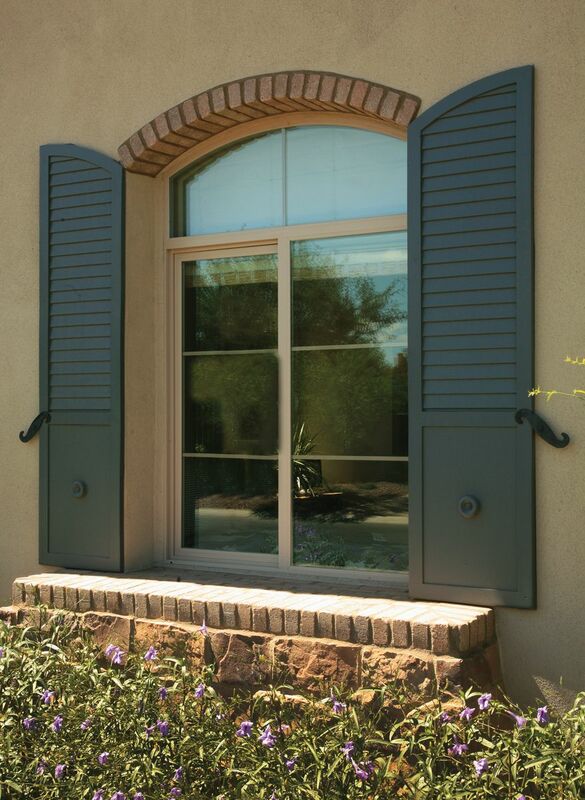 Our premium colors bring out the clean lines and angles of the window frame. Each color suits a neutral look, whether in light and dark variety, and can blend in with the surrounding wall color and create a smooth, contemporary look in your home. Milgard will only put our name on a window if it can live up to our standards. We developed a two-coat formulation that outperforms the competition. In fact, this formulation is so durable it meets the same color and gloss performance standards as our dependable standard vinyl colors. Some of our competitors’ paint reflects damaging UV rays, which over time can dull, warp and crack the paint. Milgard Premium Exterior Vinyl Finishes, on the other hand, are translucent. New coating technology allows UV rays to pass through Milgard paint so that the vinyl reflects the UV rays. This preserves the exterior color and finish. 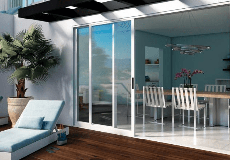 Milgard extrudes aluminum to create screens that complement our Premium Exterior Vinyl Finishes. This makes the color of Milgard screens resistant to wearing out or wearing off over time. To give you even more design and style choices, Milgard has created two-tone grids. Like the interior frame, the interior grids are white. The exterior grid colors are carefully selected to enhance the beauty of the exterior frame tone. At Milgard, we stand behind every window and patio door we build, and Premium Exterior Vinyl Finishes are no exception. We’re one of the only manufacturers to offer a Full Lifetime Warranty (10-year commercial) on a premium vinyl finish in any market. From the deserts of Phoenix to the peaks in Aspen, you can enjoy peace of mind knowing our products are built to last. Total Solar Reflectivity (TSR) – Simply stated, this is the amount of solar energy that is immediately reflected by a surface material. This measurement is important to ensure reflection of both heat and ultra violet rays, which can be responsible for high surface temperatures and fading of your window finish. Milgard has chosen a performance standard equal to our tan product; a product that has been proven time and again in the harsh heat of the desert and intense ultra violet rays of the highest elevations. 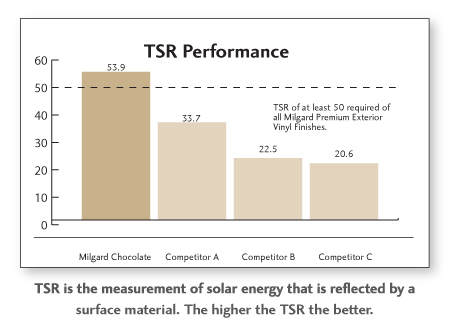 Milgard finishes were tested for TSR performance against major competitors in its markets. Results (conducted in 2011) showed that Milgard outperformed these competitors by at least 60%. Our patented Heat Reflective Technology allows heat to pass through the dark surface, reflecting immediately off the white vinyl base and keeping surface temperatures well below the competition. This technology is the result of extensive research leveraging our partnership with Behr®, a Masco company. * Colors shown are approximate. Due to monitor differences, actual colors may vary slightly. Visit a dealer showroom to see actual color. ** Windows tested had L-values ranging from 31.81 - 34.47.